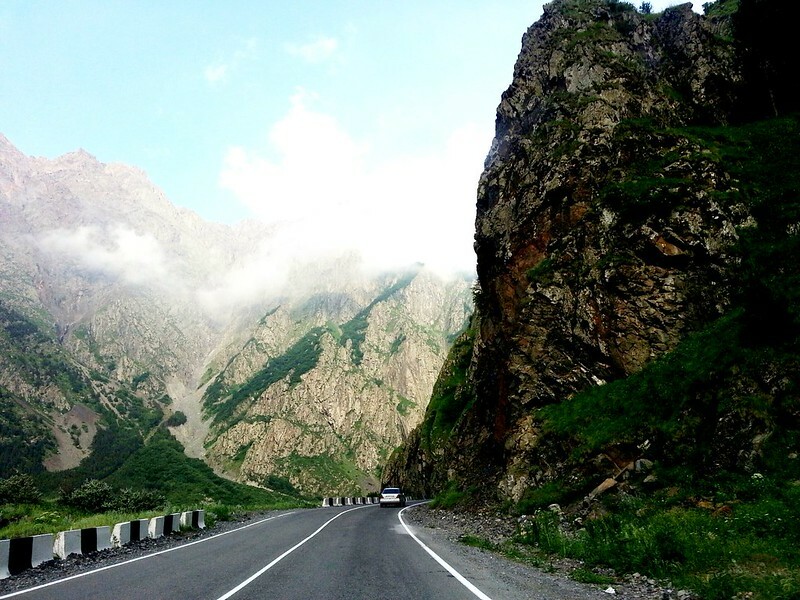 The distance between Kazbegi and Tbilisi is 150 km (94 mi). There are minibuses leaving for Kazbegi every hour from Tbilisi's Didube Station (reachable via Tbilisi metro). The bus station is the incarnation of chaos, in case you can't find (and you probably won't find!) the minibus to Kazbegi (Stepantsminda) feel free to ask around (Russian is your friend but hand language is your friend, too). The signs are not very convenient and visible. One ride to Kazbegi costs around 10 GEL (€3.80/$4.30) and takes approximately 3 hours (with an intermediate short stop at a snack shop somewhere on the way). There is no train network to Kazbegi. 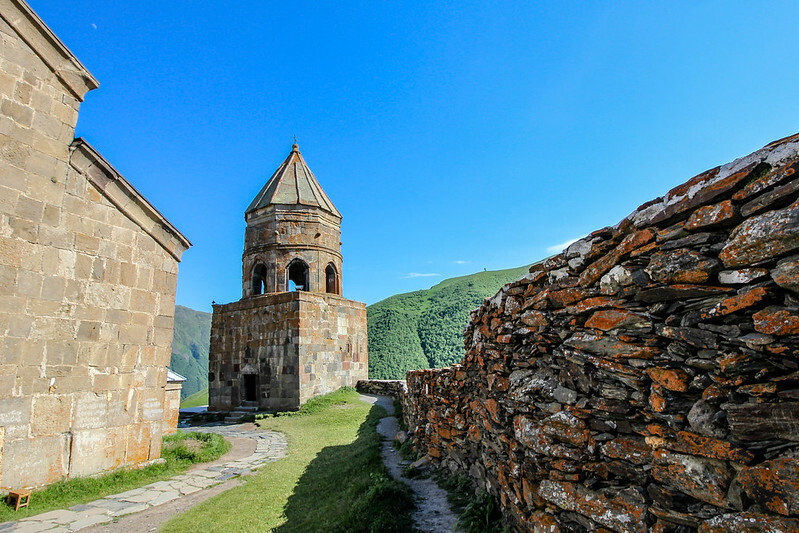 If you need to go to Kazbegi from Kutaisi or Batumi you'll need to pass near the town ot Mtskheta (20 min. north of Tbilisi). My trip to Kazbegi started at the (already well-known) Didube Station. 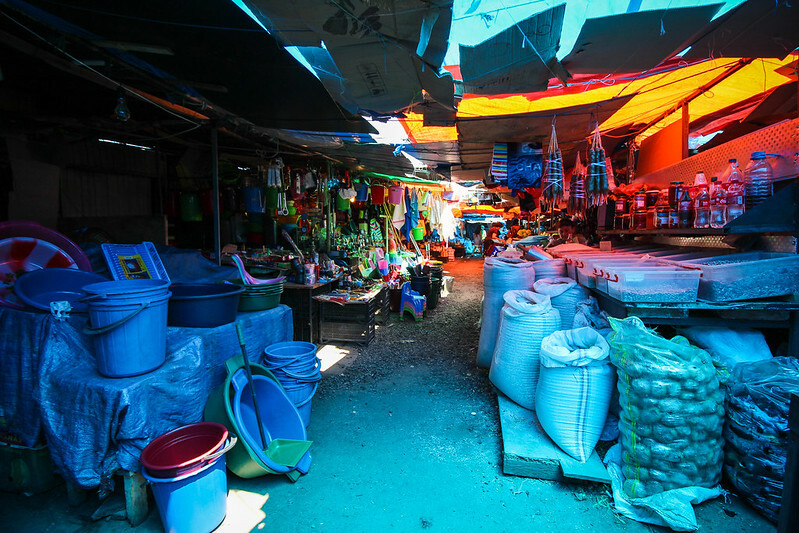 The place is a metro station-slash-bus station-slash-grocery market-slash-a huge construction site with tons of equipment. It's chaotic, crowded, hot, dusty, people are pushing and yelling, cars and minibuses are trying to cut their way through the crowds and the unpaved streets. At first it is quite freaking for a foreigner like me. But once you've seen, smelled and tasted from the Georgian culture you'll like this perfect chaos. Tbilisi, Didube bus station. Minibuses connect Tbilisi with surrounding villages and towns like Mtskheta and Gori and far away cities like Yerevan, Kutaisi and Batumi. The departure of our minibus turned to be not so smooth as expected. Some logistics issue of our green vehicle prevented us from an on-time departure because some chatty woman travelled with LOTS of luggage which made us switch cars. The 8 passengers were mostly Georgians and Russians. And a French guy who was trying to see the country within a minimum amount of time. Bon voyage! After another 5-10 minutes we were on our way to Kazbegi. The distance was 150 km along the notorious Georgian Military Highway that connects Tbilisi with the Russian (or rather North-Ossetian) town of Vladikavkaz, that gained unfortunate popularity in 2004 after the deadly school siege in the nearby town of Beslan. The first few kilometers along the "highway" were comfortable and smooth, here and there a pothole. You pass Mtskheta (the former capital of Georgia) and the Zhinvali Dam from 1986. Then the road starts getting worse and worse. Lots of construction sites slow down the traffic. Either that or sheep from nearby villages crossing the road would block the flow. The road traffic consists mostly of trucks driving to Russia and trying to cross the Georgian-Russian border before 6 pm when it closes. And the number of trucks seemed to be infinite at certain point. Georgian Military Road. 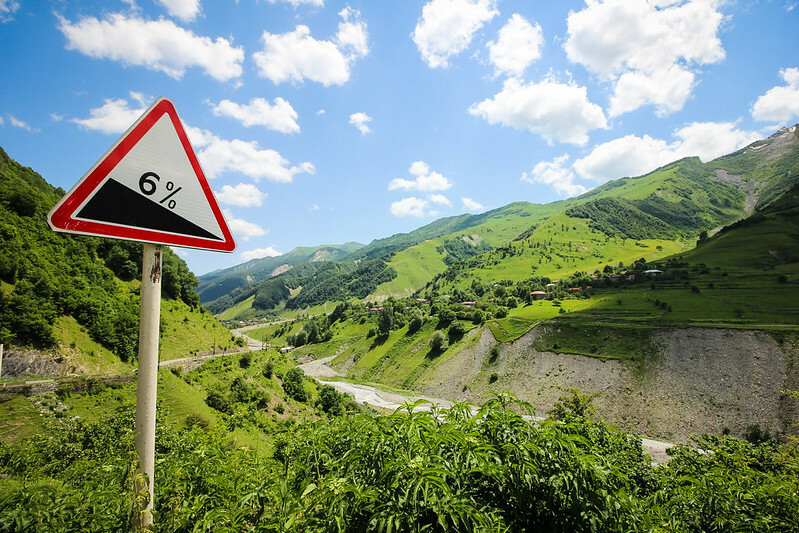 The way to Kazbegi is steep and at some point dangerous. But check out the scenery! The road got curvier and steeper as the temperature dropped. We were approaching the "Georgian Aspen": The ski resort of Gudauri at 2,200 m altitude is popular among Georgians with its great ski slopes and cosy huts & ski hotels. After around 3 hours ride for "just" 150 km we arrived at Kazbegi's main square. The town is really small and once the minibus door opened locals started offering us accomodations at very low prices. Kazbegi. The town is really small but tidy. Most accomodations in Kazbegi are family-run hostels or guest houses. Pricing per night hardly goes over 20 Euro for a room. There's one splurge hotel at one of the slopes with a great view... and great room prices: the day-price is the same as a two-week price at some of the hostels in the town. Kazbegi. The road is getting worse and worse... No renovations works planned since it would ruin the holiness of the whole place. Kazbegi. Soso driving... Taking a steady picture is tough due to all the potholes with the size of a human being... and the depth of a human being. If you don't have an own driver you can always walk down to the town's square and ask locals if they can give you a lift to the top (many of them are waiting for clients!) with their 4x4 offroad biest. Or at least they can direct you to the nearest 4x4 driver. The ride costs around 30-50 GEL (both ways, waiting time included). In case you've arrived with your rent-a-car and it is a non-4x4 vehicle chances are very high that you get stuck in some of the tremendous potholes on your way up: the road is not paved (and probably it won't get paved soon), the only trustful vehicle is a (ex-Soviet) offroad vehicle. Kazbegi. Gergeti Trinity Church in the far. Trekking to the church takes around 3-4 hours. This peak (5047 meters) has a historical meaning not only to the region but to human history as well (at least legend-wise). The legend says that Prometheus (in Georgian his name is Amirani) was chained to that mountain at 4000 m altitude by the angry Gods after he stole the fire from them and gave it to mankind. Today there is a cave up there which was apparently used to keep Georgia's treasures from the Soviet invasion. The peak is visited by hundreds of mountaineers and alpinists the entire year. In fact you might see some of these folks in your hostel chilling in the evening after a tiring climb. If you wish to hike as close as possible to the peak without any climbing you might visit the Gergeti Glacier. You should have in mind that the area is a rough terrain and you would need some suitable equipment (and a guide). The hike to the glacier takes some time, if you want to approach it within a (long) day (starting shortly before sunrise)! The trip to the peak itself is very exhausting (especially for untrained individuals like me) so unless you're a professional climber and/or a part of a climbing expedition with some guidance don't even try it... 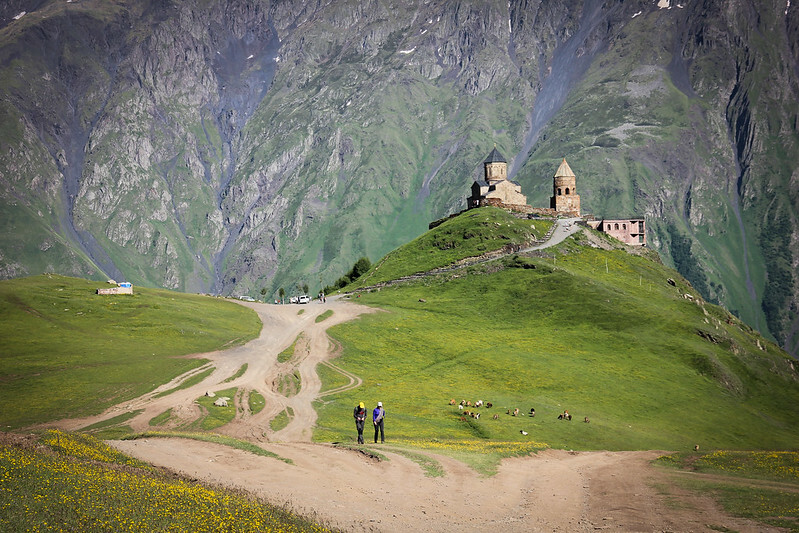 It takes several days from Kazbegi to the top and back! The town of Kazbegi (now called Stepantsminda, სტეფანწმინდა in Georgian) has a population of less than 2000 inhabitants. Years ago services were quite limited, now you will even find a bank with an ATM and an exchange office in downtown, also some supermarkets. The town could be explored on foot, if you have some spare time feel free to visit the local Kazbegi museum. Kazbegi. A local boy with his horse. 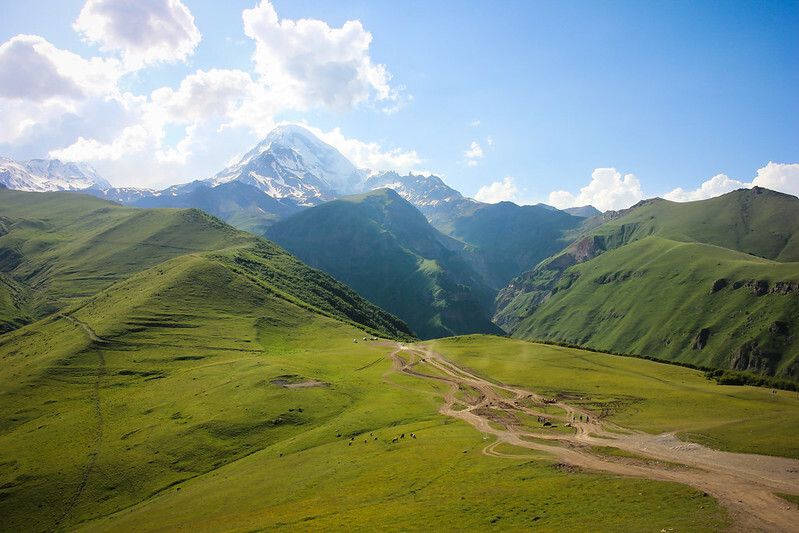 Even though Kazbegi is situated within such a marvelous natural paradise locals are sometimes unhappy when it comes to social and medical assistance. The local hospital can handle just basic needs. For further medical attention Georgians need to visit Tbilisi, which is a 3-hour ride away. Medical emergencies are treated the same way, ambulances need also three hours on the shaky gravel road to the Georgian capital. Some native movement tries to negotiate help from the North-Ossetian government. If it works out Kazbegi citizens may use the emergency services of North-Ossetian capital of Vladikavkaz which is around a 45-minute drive north of Kazbegi. This would shorten the trip and lower the chances of complications throughout the journey. The area around these beautiful waterfalls is a challenge for every vehicle. There's no public transportation so I would recommend hiring a driver from Stepantsminda, the ride is around 30 minutes. The waterfalls are "well hidden": You have to drive out of Stepantsminda on the E117 to the north, then pass through the hamlet of Tsdo. The road leads to the Georgian-Russian border which operates till 6 pm and is for Russian and Georgian nationals only. After you pass Tsdo you have to drive up to the west into the mountains. The road is in a catastrophic condition since some years ago there was a heavy rock avalanche burrying the old road, the newly-built tunnels and some equipment. The road you'll be driving on is around 10-20 meters above the old one. The rocks around the road look quite scary. Kazbegi. The road to the Georgian-Russian border. Caucasus. The Georgian Military Road shortly before the border. 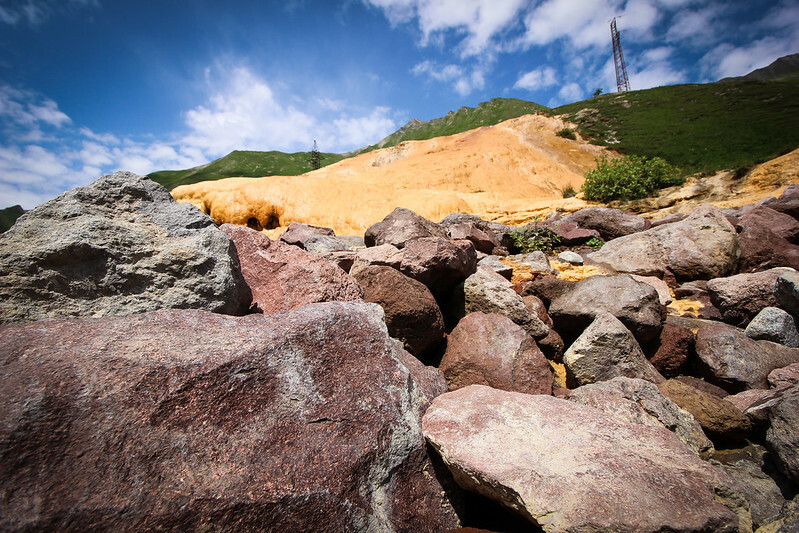 The rock slide has covered the old road and the tunnels completely under a 20-meter thick stone layer. Do you see the buried tunnel to the right after the sign? Gveleti. When you return from your trek to the Gveleti waterfalls the view to the valley is quite remarkable, too. Soso, my Georgian driver, decided to take me a step further and to show me a monastery which is very close to Russia. The daredevil roadtrip continued to the Russian-Georgian border. Just about 800 meters before the border the Dariali Monastery Complex rises from the rocks to the right side of the road. The complex itself includes the housing facilities of the monks and cannot be visited. The church however welcomes anyone. The complex was opened on September 15, 2011. Opposite the complex is the Dariali fortess. My first thought upon seeing the fortress was how the hell did they manage to bring all the construction equipment up there. The Dariali gorge has been fortified since 150 BC. While riding through the area Soso pointed out several watch towers, most of them partially destroyed. Archangel's Church. The interior of the church is sparse but beautiful. After my long road trip through this small portion of the Caucasus I had the urge to treat myself really good so I dedicated the evening to a splurge meal at "The Rooms". That's a fancy hotel on the hillside facing the Gergeti Trinity Church, some few meters outside the town. The hotel is the only 4-star hotel in the area, the town of Stepantsminda has mostly guest houses and hostels. Don't get intimidated by some of the hotel's arrogant personnel. Kazbegi. Local boy with his horse. 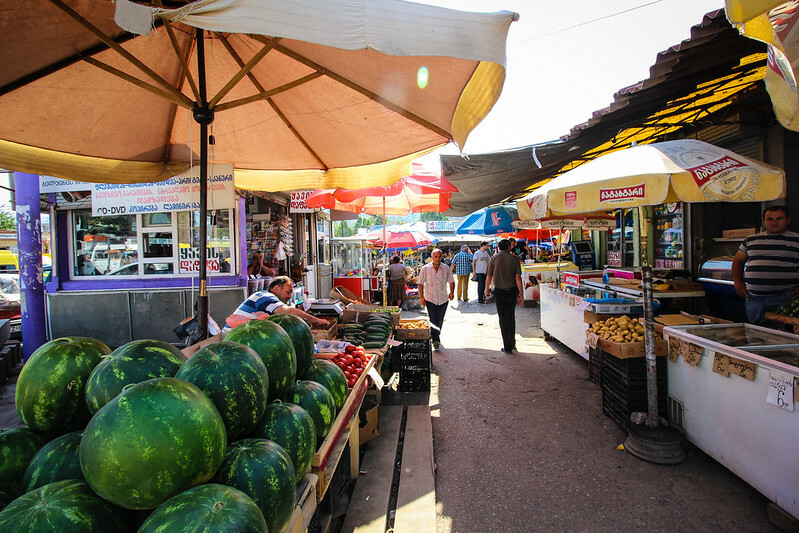 I walked up my way through the quiet streets of Stepantsminda meeting some locals and their farm animals. The hotel is fenced and surrounded by security guards but they don't mind people walking in and out: the restaurant and the viewing terrace is for everyone! Kazbegi. The Rooms hotel facing the town of Stepantsminda. The hotel was full of American tourists having some sort of an annual meeting. The restaurant wasn't however crowded. Time for some juicy Georgian beef and a big gulp of the famous Georgian home-made lemonade while enjoying the mysterious view to the lit up Gergeti Trinity Church in the Caucasian darkness! Kazbegi. The Gergeti Trinity Church lit up in the darkness. While North Ossetia shares a border with Georgia the autonomous Russian republic of South Ossetia (a so called post-Soviet "frozen conflict" zone) is on the territory of Georgia located between the Georgian towns of Stepantsminda, Gori and Kutaisi. In 1990 South Ossetia declared its independance Georgia however tried to gain back the territory using military power. That led to several clashes in 2004 and 2008. Nowadays the border between South Ossetia and Georgia still exists, it even literally divides families. 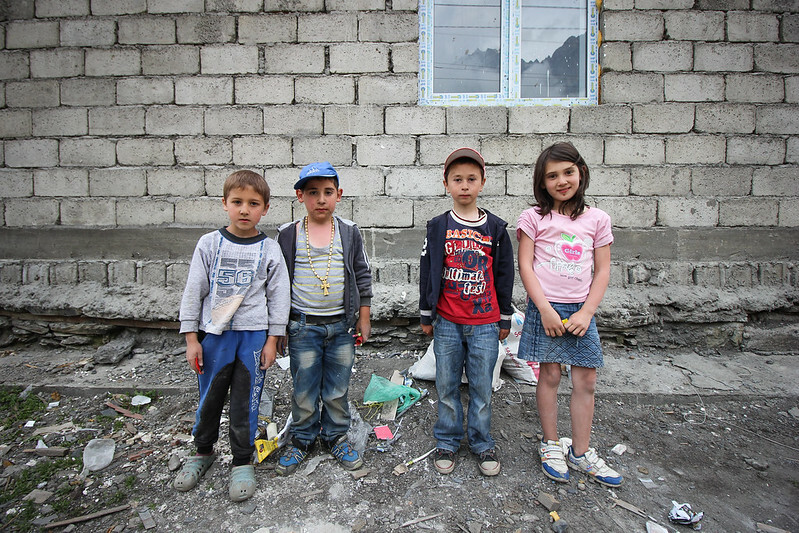 South Ossetia's capital is Tskhinvali, a poor town with around 20 000 inhabitants. The closest Georgian city is Gori to the south (the birthplace of Stalin). The roads between Georgia and South Ossetia are officially closed, there's some occasional public traffic however. Another option of entry would be through Russia (North Ossetia) and the Roki Tunnel leading into South Ossetia. Since South Ossetia is a partially recognized state a Russian visa is needed to enter its territory. Before travelling you should contact both the Georgian and Russian embassies. After a great sleep at 1.800 meters altitude I enjoyed some yummy home-made breakfast by Tamara (yes, the excellent chef): Tea with cheese and butter, a big omelette and pancakes: exactly those pancakes my grandmother used to make when I was a little boy. I couldn't be happier! "Are you going back to Tbilisi?" Anzor asked me. He had to drive two Polish climbers back to the city and pick up his son so he offered to take me. "Eat your breakfast, we're not in a hurry!" he calmed me down and gave me a big smile. Outside Soso and his brother were already preparing Anzor's mini-van for the trip back to Tbilisi. The Toyota looked small but was very comfortable, it even had a powerful air condition (temperatures outside reached 35°C at some point)! "Best car in whooole Kazbegi! ", Anzor assured me and offered me the front seat next to him. I was kind of worrying the steering wheel was on the right handside making me an essential part of overtaking procedures on our way to Tbilisi. Kazbegi. Breakfast at Tamara's. Feels like breakfast "at home". Kazbegi. Preprarations for the return to Tbilisi. This van will be transporting 8 people with their luggage. On our way down Anzor kept entertaining us with fun facts about the area, showed us some local food, let us drink horrible mineral water ("You like it?" he asked us with a grin), played for us some local music and brought us safe to Tbilisi despite the dangers (a deadly lorry crash after Gudauri) of the Georgian Military Road. "Moi brat!!! My brother! ", he said upon farewell at Didube Station back in Tbilisi and gave me that big smile again! "If you come to Georgia next time, give me a call, I'll pick you up from the airport" he promised me. "I'll show you Georgia!" Did I mention that people of Kazbegi are very friendly. Well, that applies to whole Georgia actually.